Taking on the challenge of the postmodernists of politics, Kenneth Minogue argues forcefully and persuasively that the current dominant philosophies of education rest upon a mistake. The fashionable belief that the university is society's handmaiden is confronted by a view of the university as an institution with an independent vitality and function. Minogue at one and the same time reminds us of the sources of admiration for university life in the medieval world, and how it rested squarely on its essential autonomy from the very social pressures that have come to define the modern university. The Concept of a University traces many confusions imposed by political ideology to a failure to distinguish academic inquiry from other kinds of intellectual activity, such as journalism, religious proselytizing, and high quality propaganda. 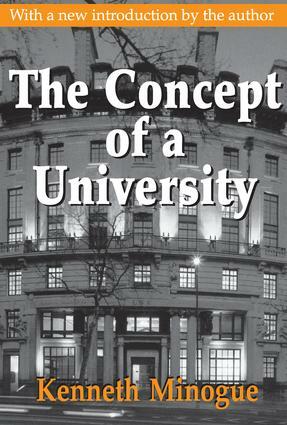 Minogue holds that where the university lacks a clear sense of the difference between the academic and the pragmatic, its vitality is sapped by conflicting purposes. Much of the present debate about the crisis in universities rests upon a fundamental error of trying to fit them into some scheme of social functions. Minogue's analysis breaks through much muddled thinking on this subject, presenting instead a coherent, relevant, and stimulating approach to higher education. In a new introduction, Minogue tells us "we have become frightfully tolerant. Anyone can become anything, and we all belong to the one practical world of churning problems and solutions. There is no doubt that a new world is being born. It seems to be a world that will have little place for the disinterested pursuit of truth. A great deal of old fashioned scholarship survives--partly by silence, cunning and exile' --in the universities' of the present day, but little relationship remains between what we used to call universities' and the things called by that name today." Is the Academic World Itself Ideological?